A very wet and boggy walk around the Central Fells. The weather today was meant to improve from early afternoon, and happily it did! But I had my fair share of rain and cold wind for at least the first two hours today. This photo shows Eagle Crag from the very start of the walk. And a wide shot of Eagle Crag with the Stonethwaite campsite in the foreground. Eagle Crag and Sergeant's Crag. My route of ascent follows the wall on the left up to the crags and head up the gully in the middle of the crag. Greenup Gill from the footbridge allowing access to Langstrath. Greenup Gill from just below the crags. Langstrath Beck from the top of the gully. The small cairn on Eagle Crag with the great view north to Borrowdale. Sergeants Crag to the south and High Raise to the left. Sergeant's Crag summit cairn. Time to head up to High Raise, which was ok to begin with be after the path disappeared it was a tad annoying. A sunlit Sergeants and Eagle Crag with Skiddaw to the far north. The far tip of the Langstrath Valley. Pike O'Stickle getting ever closer. I think on the next dry, good day I'll head up there. Sergeant's Crag and the ridge to Eagle Crag. You can see from this photo that the cloud is starting to lift. Sunlit Castle Crag in Borrowdale. Summit Trig. Col on High Raise. Here I'm sitting in the shelter on High Raise to get out of the strong wind and I still had a view of Fairfield and St Sunday Crag. The grassy, boggy slopes of Ullscarf. Fleetwith Pike over Rosthwaite Fell. The cloud has risen and broken even more making most summits cloud free and allowing lots of lovely sunshine to get through. Ullscarf summit cairn. 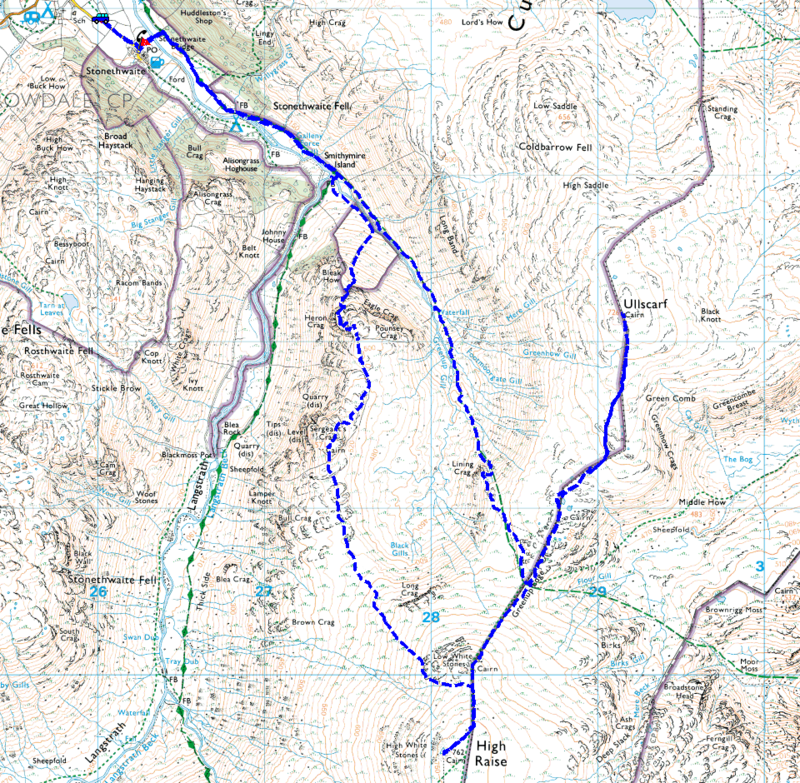 Time to head back to Greenup Edge and take the path down Greenup Gill. Sun rays over Langstrath and Esk Pike. Looking down Greenup Gill from the top of Lining Crag. Greenup Gill with the sun out. The view back up the Greenup Gill path to Lining Crag. Eagle and Sergeant's Crag just before finishing the walk.